Apart from reading Great Battles of the Classical Greek World by Owen Rees, at the same time I was also reading A Naval History of the Peloponnesian War – Ships, Men and Money in the War at Sea, 431-404 BC published by Pen & Sword Maritime in 2017, ISBN 978 1 47386 158 9. The book is the result of DeSantis’s research for his previous book, Rome Seizes the Trident, where he looked at Rome’s eventual defeat of Carthage at sea by the application of simple tactics against a more skillful opponent along with steadfast resolve. The Athenian fleet (skillful mariners) were brought low by Syracusan blunt force, prow-to-prow tactics. The Peloponnesian War was largely decided by battles and a strategy at sea. When Athens’ control of the sea crumbled, so did its empire. The classical sources used for the book are Thucydides, Plutarch, Diodorus and Xenophon. There are also a Preface, Conclusions, Notes, Bibliography and Index. The itself book covers the naval history of the 27 years of conflict that was the Peloponnesian War. DeSantis outlines the struggle in the Introduction, noting that Sparta supported by Persian gold eventually overcame Athens although it was the loss of the Athenian fleet at Syracuse that signaled the end for Athens rather than any action of Sparta. DeSantis traces the war from the sources, first looking at the causes of the war presented by Thucydides as he saw it and he mostly relies on Thucydides’s narrative to 411 BC. Xenophon picks up the tale from then along with Diodorus of Siculus. Plutarch of Chaeronea writing some 500 years or so later in his Parallel Lives looks at the biographies of the Athenians Themistocles, Cimon, Pericles, and Alcibiades along with the Spartan Lysander. Lastly the Hellenica Oxyrhynchia also mentions wartime events including the Athenian seaborne campaign in Asia Minor in 409 BC and the Battle of Notium in 406 BC. These then are the classical references used by DeSantis. DeSantis covers the economics of the naval build-up of Athens, noting that the 100 talents (600,000 drachmae) in silver extracted from the Laurium silver mines was sufficient to build 200 triremes. He then notes that Pericles estimated the same cost for each year of war against Sparta. In the second section the author examines the trireme (triers in Greek) with Thucydides identifying Corinth as the first to construct a trireme although there is a competing theory that the trireme may have actually originated in the east with the Sidonian of Phoenicia (trikrotis naus) or the Phoenicans themselves constructing the first such vessels. The construction of the triremes of Athens is covered including details of where the wood and pitch was sourced from along with the number of men required to move a trireme up the 1 in 10 ramp into its shed (140) as well as take it back into the water (110). One thing that had not occurred to me before but perhaps should of is that there were different quality triremes. The best were known as exairetoi (selects) while others were identified as first, seconds or thirds. Old vessels were converted for troop transport – with a converted trireme able to transport 85 soldiers. Tactics are covered with discussions of sailing with the wind and under the power of oars. Masts and sails were generally taken down before battle and preferably left on shore to lighten the load in the trireme prior to battle. The main battle manoeuvres are described, being the diekplous and the periplous. Less skillful fleets relied on coming alongside and boarding the enemy. Rounding out his review of the trireme, DeSantis covers shipboard fighting, funding a fleet, the officers on board, payment on campaign, and propulsion. The next part covers the whole hubristic disaster for Athens that was the Sicilian Expedition. DeSantis concludes with the eventual defeat of the Athenian Empire. While there were many land battles throughout the Peloponnesian War, it was at sea that Athens was at first strong, then later faltered. I very much enjoyed this book, especially as I was reading it at the same time as Great Battles of the Classical Greek World. There was some overlap between the two books so taking an alternate view on some matters was a benefit. If you are a naval tragic like me, and an ancient history addict as well, this book will serve well as an overview of the Peloponnesian War from the naval perspective. Thucydides and Xenophon are still the main sources to read but DeSantis’s book is both easy to read and factual. This is a good book providing a good amount of detail and covering one the more exciting stories from Ancient Greece. I am now looking for my copy of Thucydides to read further into this conflict again, one that I have not looked at for about 30 years. Recommended. I finally finished reading this and I am glad I did. Already, as a result of the first quick look, Anthony and I had decided to expand our little ancient Greek project to include the Persian invasion. I thought I had a good understanding of the politics, military systems and battlegrounds of this conflict but Shepherd’s book has me reaching for other reference works as I reassess my understanding of this conflict of systems. The coverage of the forces, commanders and opposing plans sets the stage for the conflicts to come. A good interpretation of Herodotus along with a review of other sources and secondary works makes this book one of the few that actually covers the battle of Plataea. The illustrations of Peter Dennis are very evocative and help bring the text further to life. I particularly like “the Most Glorious Victory Ever Known” illustration on pages 70-71 and want my Greeks and Persians to look like that. The battle maps really help to understand the flow of the battle and Shepherd’s interpretation of it. It is also quite nice to have an Osprey where the supporting photos are generally all colour and not taken in the 1950s – modern photos of the supporting materials. Well done William, this is a wonderful addition to the Osprey range and I wholeheartedly recommend it to anyone with an interest in ancient history generally and the Greek and Persian Wars in particular. “What’ll we do for our next period?” asked Anthony. So, I needed to start to think about Greeks. Would it have been the Spartans or the evil Empire (Athens). I wanted reference works and one or two good planning sessions. Out came the electronic version of Thucydides, something to read again on the Kindle on the flight back to Australia. 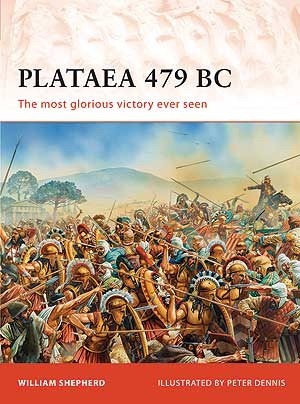 Just before leaving Singapore for Australia, I noticed that Osprey had just released Campaign 239, Plataea 479 BC, written by William Shepherd and illustrated by Peter Dennis. 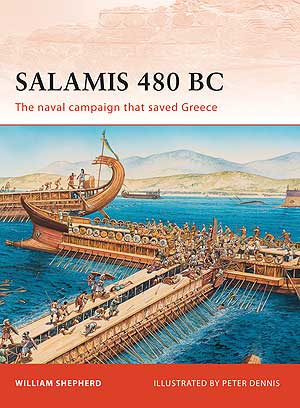 William had been good enough in December 2010 to send me a copy of Salamis 480 BC – the Naval Campaign That Saved Greece for review. Apart from being stimulated by that read, it was a thoroughly enjoyable read in any case. So, I think I should get a copy of Plataea I thought to myself. Whilst it is not a Greek versus Greek affair as such, it was perhaps the catalyst that gave rise to the actions that resulted in Athens becoming an empire and as such, facilitating the start of the Peloponnesian Wars. I thought, then, that I would order Shepherd’s Plataea but it was time to travel back to Australia so never got around to it. What a lovely surprise then when a parcel arrived in the post today – a review copy of Plataea provided by William (thank you sir). Plataea itself was one of the largest land battles in the Ancient World with around 100,000 Greeks taking on a larger number eastern forces, members of the Persian Empire and including some more Greeks. The battle lasted over several days and at the end the Persian threat to Greece was at an end. The Athenians in particular used this campaign as an excuse to take the struggle to Asia Minor and ultimately led to the development of the Athenian Empire. Shepherd has a very clear writing style and is easy to read. Peter Dennis’s illustrations really bring this battle alive and it has certainly provided a great inspiration to me for the next great wargames project in Singapore … but more of that later. I am really looking forward to reading this book and as I have an 8-hour flight to Singapore coming up in 10 days time, I know what I will be reading on the plane. Once I have read it, I’ll provide a more in depth review of the book and publish that here as well. I’d just left for a trip overseas when my partner mentioned that there was a parcel for me at the post office. She collected and told me it was a book. I knew then it was the Osprey Publishing Campaign number 222. I’d received an email from the author, William Shepherd, promising me a copy to have a look at. I am glad this volume arrived. This book has been written in the Osprey Campaign series format attempting to cover the topic in 96 pages. The book contains a mix of historical background and modern interpretation coupled with photographs of contemporary artefacts, artistic interpretation and modern photographs of the battlefield, in this case the straits at Salamis. I will freely admit that I am both an ancient tragic and a naval tragic so there are few better things for me to look at than a book about a topic like Salamis (maybe the Battle of Cape Ecnomus)? This is also a useful Bibliography included at the end referring the reader to a number of other works for further study along with an index. Much of the analysis of the performance of triremes (trieres) at Salamis is based on various analyses of the Hellenic Navy’s Olympias, a trireme constructed in modern times based on information provided in the sources. Shepherd makes good use of this analysis as well as a number of photographs of the Olympias underway and in dock. As you read this work it is clear that Shepherd has a strong interest in both ancient Greece and in naval matters, especially in reference to the oared fighting vessels of antiquity. Along with clear readable text, there are some interesting illustrations painted by Peter Dennis which give a clue to how ancient naval battles must have looked. The battle maps in this book also give a clear indication of how the Greek dispositions severely hampered the Persians, effectively negating the quantitative advantage Xerxes enjoyed. I can thoroughly recommend this book, especially to wargamers interested in ancient naval battles as well as those with an interest in ancient Greece. The book itself provides an excellent description of the battle and Dennis’s illustrations have me looking at my 1/1200th triremes and considering how to add flags to the stern of these vessels. I, for one, am looking forward to Shepherd’s next book which I believe concerns Plataea.